Back in November, I told you that we started project powder room - November. Sad thing is when I searched my blog for the powder room inspiration post, I realized it was written many months ago. I promise we are going to get this thing done soon! We hit a few hiccups that were a little discouraging and un-motivating. Removing the wallpaper wasn't good enough, the walls were really patchy, so we had to skim them. Then sand them down; my husband was not such a big fan of that part. Luckily he purchased a huge shop vac on black Friday that easily cleaned up the mess. When he decided to tackle the sink removal one night, let's just say he needed saving and a lot of towels were used. Sometimes old houses are frustrating. With that said, we are on the uptick and now that everything is out we can really get to work making this a super cute powder room with old house character! Today, I convinced my mom to hit up Home Depot with me to check out floor tile. Oh yeah, I made the decision that I want to rip out the floor...I mean if everything is out, it's now or never. Plus the little white squares that someone put in years ago aren't lined up and it makes me crazy. I was so excited by the options I found at Home Depot! They had exactly what I was wanting to see and at good price points. I think the second one is probably my favorite because I love that it's not solid white, adds a little more detail. With that said, it's hard not to just go with the option that is 1/4th of the price. It's pretty and fits the style of our house. I will say though if I want to put marble tile somewhere, I should probably put it in the tiny bathroom so I don't have to buy as much! The hexagon is really pretty too if we decide the black and white is too busy for the small space. I also want to get opinions from people who know more about tile because I want something that will last. It won't get everyday use, but it will be a staple for guests. It's a good thing that I found great options, but I just don't know what to go with! 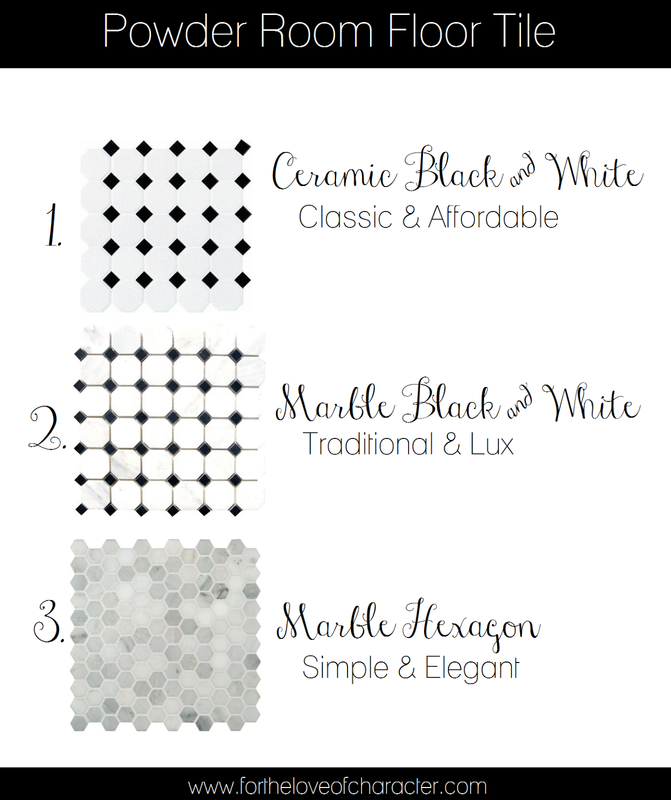 Yes, the marble options are so pretty! Glad to inspire and thanks for the thoughts!